The art of pot making in and around Chesterfield has been proven since Roman times due to the fact that there is an abundant supply of clay, coal and water in the vicinity. The clay in fact runs in bands along with the coal seams and this led to the production of a small scale domestic market of pottery for everyday use. By the 1700's the Germans were exporting many hard, impervious glazed drinking vessels into England produced by a secret process. When the secret was revealed to local potters it led to the production of salt-glazed pottery in the area. The secret was for salt to be thrown into the kiln during the firing process to give it a brown hard glaze which could be produced by having only one firing of the pot. With the previously mentioned supply of clay for potting, water for mixing and coal for firing the kiln the process was made complete by the salt which was transported over the Pennines by pack horse from Cheshire to Chesterfield. (hence Saltersgate or Saltergate, the main pack horse salt route into Chesterfield). With the later improvements in transportation, Turnpike roads (mid 18th Century), Canal 1770's, and the Railway 1840's, Chesterfield was able to export many of the pots both Nationally and Internationally culminating with Pearsons Pottery being the largest British manufacturer of stoneware between the wars. The local potters had put serious weight behind the plans to build the Chesterfield canal where some of the items in the photograph were rescued from. Pearsons are listed as having mines of both clay and coal during the 19th. & 20th. Century. 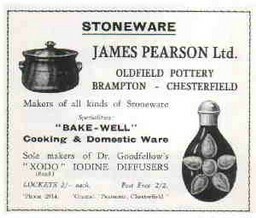 Many if not all of the resources required in the production process were mined on the site of the potteries and the Brown ware pottery or Chesterfield ware and Bristol Stone ware were produced at Brampton, Newbold and Whittington and went on to supply other manufacturers with empty vessels to be filled in their factories. There were many uses for this pottery in every day life from stone jam and preserve jars to bed warming pans and chamber pots. An offshoot of the potters art was the production of the many clay pipes which were smoked by both men and women during the 19th. Century and before. Alma. Barker. Brunswick. Brushes. Inkerman. London. Oldfield. Pearsons. Walton. Welshpool and Payne. Wheatbridge. Whittington. There were of course many others. After the first half of the 20th. Century there were few of the potteries left mainly due to the invention of new materials and processes and the scarcity of raw materials on site. The potteries had been built on the reserves of clay and by now these were nearing exhaustion. A new lease of life was given during the Second World War when the local potters were given many contracts from the armed forces but after the war the last of the potteries suffered a steady decline even after diversifying products materials and processes, ending in closure of all of the potteries by the 1980's. Produced in 1925 by Pearsons & Co. Chesterfield. Walker, Richard. Collis & Co. Whittington Moor. *= Also manufacture stone bottles. Sited at New Whittington and formed in the nineteenth century. The pottery was originally a brickworks and was owned by the Turner and Green families. Delightful Pottery from the works. Many thanks to John Jarvis for the photograph. The Alma pottery was opened in the 1850's as a partnership of George Blake, John Knowles and Samual Lowe. Blake was a thrower, Knowles was the burner in charge of the firing process and Lowe was the business manager. Lowe buying out the other partners by 1862. Brunswick being taken over around 1870. The works were closed by 1914. Established by Samual and Henry Briddon in 1927 and became the Barker pottery company in 1914. Barkers was formed by combining Walton, Welshpool and Payne and Walton potteries in the early twentieth century. During the 1920's the pottery was owned by Crossley and Yates and in 1932 it was purchased by Albert Turner after he dissolved his partnership with the Greens and Albion Pottery. In operation at least until World War II. This pottery produced what was called Ashgate Puncheon Pottery (large bowls for mixing bread). Formed some time in the nineteenth century and owned by the Heath Brothers in 1908. It was on the site of the former Inkerman colliery. It closed in the 1930's. This pottery was built by the Lipscome Company of London in 1878 for the production of water filters. James Pearson purchased the pottery six years later and connected the works by railway to his Oldfield works. The pottery may have used clay dug on site. The pottery closed in 1931 with the buildings being used as a warehouse for Robinson and Sons. Established around 1830 under management of the Sharratt family and possibly owned by the Briddon family of Brampton. It was taken over in the 1880's by a Mr. Clark. Not in use by 1919. Established by a partnership of Oldfield, Madin, Blake, Wright and Hewit in 1810. By 1838 the nephew of the founder John Oldfield greatly expanded the works. The works were purchased by James Pearson in 1884 who had left the Wittington Moor potteries to set up on his own. In 1905 James pearson who was twice Mayor of Chesterfield died and the works were then taken over by Dr. J.Goodfellow until 1938 when the company merged all the potteries and all work returned to Whittington Moor. Established at the end of the nineteenth century by Henry Briddon was one of the only Chesterfield potteries to produce fine, ornate, decorative pieces of pottery (Brampton ware). It merged with Welshpool and Payne in the 1880's and thus became part of the Barker company. It was at one stage owned by the Plowright Brothers and William Gordon who experimented with salt glaze and ornamental pottery. The pottery itself was demolished during World War II but William Gordon continued his work at Old Whittington. Founded in the eighteenth Century this pottery was run by Mr. Blake and after his death by his widowed wife. Mathew Knowles took over and enlarged the works in the middle of the nineteenth century. The works becoming part of the Barker company by 1914. The works closed as did the rest of Barkers in 1957. This pottery was one of the first potteries in Brampton and first manufactured pots and clay pipes for William Robinson in 1750. The pottery was later leased from William Robinson by Edward Wright and Samual Stenson in 1769 and the Wright family continued the potters tradition throughout the nineteenth century. The works closed in 1937. There were several potteries in the area from Stonegravels through Whittington Moor to Whittington with the same or similar names. Started between 1650 and 1700. An early pottery was set up by William Bromley by the early 1800's. Taken over by Robert Bainbridge in 1807 and further taken over in the middle of the nineteenth century by William Johnson and Aaron Madin. Both Madin and Johnson were Wesleyan Methodists and owned other potteries nearby. 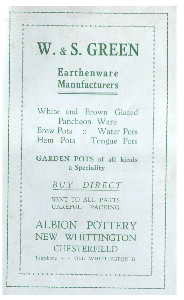 Later this pottery became Pearsons 'Top Pottery' on Sheffield Road. It was taken over by Derbyshire Refractories LTD in 1947 to make kiln and furnace bricks. It closed in about 1970. Another Whittington pottery was being run by Samual Samforth and John Cartledge from 1793-1805. It was first managed and then sold by auction to Isaac Cundy and Thomas Dutton who were both millers. The mill was sold on later in 1810 to William Johnson the potter of Newbold during the 1830's. After her husbands death Catherine ran the pottery with her nephew James Pearson until her death in 1895. It remained in the Pearson family until the death of Theodore Pearson III in 1959. 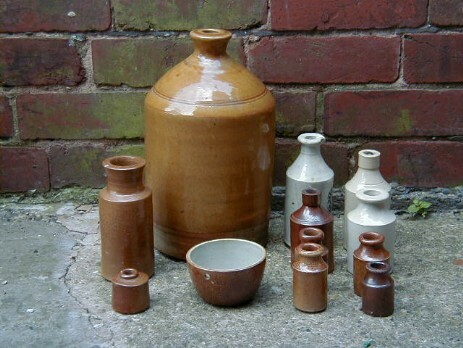 Pearsons were able to mine resources locally and purchased several other potteries, clay and coal mines and brick yards to enhance the companies position as major potters and in self sufficiency. One of the potteries was established in 1810 by Pearson and Company. Another, the 'Stone Bottle Works' was founded by Aaron Madin in 1818, on his death in 1878 it was taken over by his son-in-law Samual Lancaster and closed in the first few years of the twentieth century. Update to Pearsons Pottery. 1. My crystal ball (or rather a modern butter dish made by Pearsons) tells me that the Pearsons pottery was established in 1810 and one could presume that they have been using marks since that time or at least from the mid 19th century when this became fashionable. They did do a lot of work for other people who had their names and logo's on the front of jars and bottles so one could also presume Pearsons would include their mark somewhere. There does not appear to be a catalogue of marks to date their pots. I am not sure when the pottery ceased operation but I think it was in the early to middle of the 1990's. If anyone knows an exact date please let me know. Update to Pearsons Pottery. 2. I worked at Pearsons from 1977-1982, when I was made redundant. The Company was then downsized in an attemped to save it after a local businessman called Mr Roberts ( I think) bought it. The pottery only lasted a couple of more years, but i'm not exactly sure how many, but from time to time I bump into old workmates who did, I'm sure, work until the end of production. You are right in saying that some items were made for individuals, and my claim to fame is that I personally glazed a flan dish (set of six) for a woman who makes Elton John's meals for him!!! The centre of the dish has the recipe for an Elton John game pie. I hope this is of some help, any other questions you may have, please feel free to e-mail me. The following is an email from David Siddon who offers the following information about Pearsons pottery. Many thanks. I read your history of Pearson’s Pottery with interest and can offer the following advice. The Peason’s est 1810 mark is slightly misleading as it wasn’t used until the 1970s. They went through several embossed marks including some that put Whittington Moor as “near” Chesterfield. I know several people that have tried to make a chronology of marks but the plain truth is that they often overlap and usage was never consistent. Strangely they returned to an embossed mark almost at the end of their history. In the end they sold out to Cloverleaf who asset stripped and closed the pottery, though the sad truth is that there’s been woeful lack of investment. The kilns were so dilapidated that 70% wastage was not uncommon towards the end, and that level of loss is unsustainable. There was a small scale employee buy-out and pottery was produced on a very small scale until 1996. Other potteries that they made wares for include, Doulton, CeeDee, Price Cash, and Hartrox. There is a certain amount of confusion over marks from other names that Pearsons operated too. They inherited the James Pearson brand in the 1930s, closing all the Brampton Potteries and concentrating production at the Whittington moor site. James Pearson (a rival member of the same family) had several lucrative government contract, most notably the GPO. Pearsons operated the James Pearson name independently at least into the early 1970s even though James himself died in 1905. There is also a mark of Laney Pottery Chesterfield, the most common piece being a pink bowl made of interlinked scallop shells. This is another pseudonym of Pearsons. ‘I thought you might be interested in this photo of the workforce of M Knowles Pottery 1928’. The photograph is copyright Roger Powell. Many thanks to him for sharing it with us.